Meet four "convicts" who have been unjustly incarcerated since August! These beautiful creatures were abandoned at a boarding kennel and good ole "mom" skipped out on the bail. That left them in a concrete cell with no human contact other than at cleanup and feeding time. We have already found a foster home for Zorro, a handsome male Belgian Tervuren, and we have located a foster for Apache, a very large male white German Shepherd, who is emaciated and in need of lots of nourishment, a health check, and tons of hugs. These fur kids were so happy to have someone visit and touch them that we could not accurately evaluate their temperaments or training levels other than to say that all were extremely friendly!!! All 4 will be gorgeous once cleaned and fattened up. They will need to be altered, vet checked, microchipped and reevaluated. For the time being, we're estimating Chaos (a female) to be about 15-18 months, Dante (a male) 2 to 3 years, Apache 18-24 months and Zorro 4-ish. UPDATE 12/2/03: The Mesa Four have been sprung and are now in our custody!! They are prisoners no more. Zorro is heading home with Betty for a bath and some TLC and good food, Apache is headed for a bath & brush at Millie's and then on to ICU at his foster's until he's checked out and given the "once over." Dante & Chaos are in a temporary foster situation until we learn a bit more about them and move them to a suitable home environment. A HUGE THANKS to Theresa Egge of Teremarc Shepherds for providing valuable space which enabled us to bail Chaos and Dante out at the 11th hour and to Betty Marotti who drove the "getaway car" and provided a foster home for Zorro. Thanks to everyone who expressed their concern and tried to help. We will update their info as soon as we're able. CHAOS UPDATE 12/12: Chaos visited the vet on 12/10 and was declared healthy. We did extensive blood work and the results: she is NEGATIVE for Heartworm, Valley Fever, Tick Fever and EPI. Her blood chemistry was normal as well. She is about 10-12lbs underweight. Chaos is a marshmellow! She is somewhat submissive, NOT "spooky" or skittish but clingy...she will become some lucky person's velcro dog for sure. She knows her basic stuff, walks well on lead, rides well in the car and is crate trained. She was not at all agressive when introduced to other dogs, but typical of most females, will probably set the level of play. She was perfect with her foster's fragile Italian Greyhound and lovingly licked his face (as though she knew to be careful with him). She will be fine with children...don't know about cats yet. She is young, playful, high energy and VERY eager to please. Chaos is very responsive to her person and seems crushed if she thinks she's disappointed you. She was moved to a private home foster on 12/13 so we will soon have a better idea of her behavior in the house. Chaos will be spayed prior to placement. UPDATE 12/22: Chaos is doing wonderfully while in the care of her foster mom, Andrea. She follows her everywhere, was great getting a bath, and is so good in the house that Andrea is not letting her go!! She will be spayed on December 30th, then officially adopted...Thanks, Drea! DANTE UPDATE 12/12: Dante went to the vet on 12/10 and was declared healthy. We did extensive blood work and the results are excellent...he is NEGATIVE for Heartworm, Valley Fever, Tick Fever and EPI. All of his blood chemistries were within normal range as well. He IS however, 20 lbs underweight and we're sure he will enjoy the fattening up process! Dante is very friendly, knows basic obedience and played well with males, females and puppies. He seemed O.K. with the few children he was around for a short period of time. He is playful, high energy and runs like a gazelle. Dante was moved to a private home foster on 12/12, so we will soon have a better idea of his house manners. He will be neutered after a little weight gain & prior to placement. UPDATE 12/17: One look at the top photo and you know that going from a concrete floor to his foster's featherbed has Dante groovin! In fact, the first thing he does when Mom gets home from work is head for the bed and roll in the splendor of its softness. Dante and SWGSDR wish to express our sincere gratitude to Julie Kimball for extending her hospitality to our boy on very short notice. Dante is an absolute love bucket. He is puppy playful but a good boy in the house. He can "sit" and "down," yet we can tell he hasn't been asked to do much of late. The basics are there...he just needs a refresher course. Dante was cooperative and calm getting a bath, plays appropriately with his foster's female and loves to chase, but not hurt, the cats. He is housebroken (one accident so far), crate trained and apparently well socialized. UPDATE 2/14: Dante, his new main squeeze, Ixtla, and Mom Julie took their first road trip to Utah to see Grandma & Grandpa. They made a great traveling Trio! APACHE UPDATE 12/4/03: We've discovered that Apache knows basic obedience commands and is a complete sponge when it comes to love and attention--he just soaks it up. He rides well in a car, but does try to fling himself out when the door is first opened; we're working on that. Apache has had his initial bloodwork completed and has tested negative for heartworm and tick fever. He tested positive for exposure to valley fever, but it was such a very low titer reading that our vet advised that it was probably the result of an old exposure and not to start any medication. We're following his advice and will wait a month and test him again. In the meantime, he is eating like a horse and gaining weight daily, which is an excellent sign. Apache is crate trained, housebroken and seems to get along well with cats and other female dogs. UPDATE 12/9/03: Apache has gained 4+ pounds this week and is doing beautifully. What a loving personality he has! We keep trying to tell him that life will get even better once he finds his forever family, but in the meantime, he's happier than he's been in a long time. UPDATE 12/13/03: Apache was moved to his new foster home today with Lisa, Cujo (the cat) and Niki (one of our L.A. rescue kids). He seems to have settled right in, and Niki is showing him the ropes. Now he can learn what living in a real home is like and how it feels to have a sister to play with and a yard to run in. Lisa promises to fatten him up and make sure he's well loved and taken care of. Apache is very high in prey drive and will chase anything small that moves, so a home without small pets is probably the best for him. He has learned to leave the cats he is currently living with alone, but he must always be supervised as he does love to chase them. Apache has been Buddy Tagged and microchipped and will be neutered after a little weight gain and then available for adoption. UPDATE 12/19: Apache was neutered today and came through with flying colors -- he weighed in at almost 77 pounds. A 7 pound gain since his "liberation," but just a start for this big hunk of a boy. After a week of recuperation time, and a little more weight gain, Apache will be ready to go to his new home. UPDATE 1/1/04: Apache's home visit with the Brownell Family went very well. He soaked up the love and attention of Steffi and Tommy (even tolerated being blanketed and draped with a kimono by the kids), and understands that Lucy is going to be the BOSS! Looks like our boy will be moving to Estrella Ranch in the very near future! UPDATE 1/12: Apache was seen by our veterinarian today and showed a 10 pound weight gain since being rescued. Everyone at the vet's office who has followed this wonderful boy's road to recovery came to visit him and to wish him well in his new forever home. UPDATE 1/14: The Brownells came to pick up their new family member last evening. Reports of his first day are excellent. He is being patient with the children and allowing Lucy (the family's female GSD) to be the boss without question. He was allowed his freedom on a walk in the desert, and returned happily when called. Looks like our white coated "convict" is home at last. We will miss you and your loving spirit. Have a wonderful life, Apache. You certainly deserve the best. ZORRO UPDATE 12/13: Isn't it amazing what a bath and brush and some TLC and good food can do? Thanks, Betty!! The family that was supposed to have adopted Zorro encountered a medical problem with their other dog who has since had surgery. They are concerned about undue stress on their recovering dog so have opted to wait on adopting another. Zorro is now available for adoption. At his foster's home, Zorro has been exposed to horses, chickens, ducks (as well as four other dogs) and surprisingly, has not even hinted of giving chase. Rather unusual for a herding breed, (although, he has not been left with them unsupervised). He gets along well with both male & female dogs, yet is prone to following his human around and appears to prefer the company of women. His beautiful, long, plush coat will require regular brushing and/or monthly grooming. Other than that, he's an affectionate, loyal, easy keeper...This young boy is an exceptional find! Zorro is about 3 years old, neutered, and will be microchipped. UPDATE: Zorro went to the vet last week for his shots and a final once over before heading to his new home. He was found to be in excellent health and coat, weighing in at just under 60 pounds. He has been microchipped and Buddy Tagged and is ready to move in with his new friend, "Valadee," a rescued Belgian sheep dog. 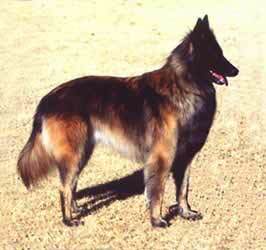 His new mom had been on a waiting list with the American Belgian Tervuren Club's (National) Rescue. CONGRATULATIONS KATHY ON A RARE FIND! ZORRO WENT HOME ON FEBRUARY 8TH AND IS DOING FINE...EVEN WITH THE CAT!